The NFTS has been given the prestigious prize in recognition of the role it has played developing British creative talent for nearly 50 years. It is the first time an educational institution has been given the award. In addition, our students did us proud by winning their fifth consecutive British Short Animation BAFTA with Poles Apart directed by Paloma Baeza and produced by Ser En Low. If that wasn't enough, Producing MA graduate, Emily Morgan along with the film’s director and writer, Rungano Nyoni won Outstanding Debut by a British Writer, Director, or Producer for I Am Not A Witch. And NFTS Cinematography graduate, Roger Deakins clocked up his fourth BAFTA winning the Cinematography award for Blade Runner 2049. 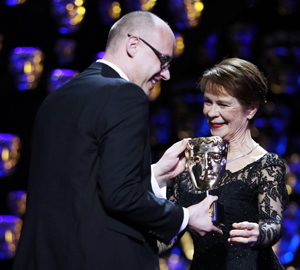 NFTS Director Jon Wardle and Former NFTS Director Nik Powell collected the Oustanding British Contribution to Cinema BAFTA from award-winning actress Celia Imrie. Jon delivered a powerful speech describing how for almost five decades the NFTS "has been at the forefront of developing film, television and now games makers who are not only highly valued members of the industry widely in demand, but who also have the skills, talent and social conscious to lead it." Jon paid tribute to NFTS founder Colin Young who wanted to develop a school that is dedicated to the idea that "filmmakers should be missionaries for a better way of life". Continuing, Jon said: "Colin imbued in our students not only a sense of purpose but a spirit of confidence, of fearlessness, of risk taking. And those qualities have been central to our school’s ethos ever since." "You can see those qualities in the work our students produce at the school and you can see it in the work of the 10 students and graduates nominated for BAFTAs tonight. From Roger Deakins for Blade Runner 2049, to Stuart Wilson for Star Wars and Dario Marianelli for Darkest Hour through to more recent graduates such as Emily Morgan and Paloma Baeza who competed and won in the Best Debut and Short film Categories. At the NFTS our goal is to ensure that the future Roger Deakins or Emily Morgan – wherever they may come from and whatever their means – have the opportunity and support to reach their full potential. "But we can’t do that on our own. We are therefore hugely indebted to those who, year in and year out, continue to support the School including the DCMS, BFI, HEFCE, Creative Skillset, Channel 4, BBC, Sky, ITV, the Film Distributors Association and UK Cinema Association. As well as more than 80 annual scholarship donors, trusts and foundations. Thank you we couldn’t do it without you."